The iPad is the quintessential blank canvas, allowing you to create digital masterpieces from simple sketches to watercolour wonders. From its inception, the iPad has been embraced as a way for digital painters and artists to create stunning images with little more than their fingertips and a spark of imagination. As new features (such as Retina screens and more powerful processors) have been introduced to the hardware, accessories such as pressure-sensitive styluses have become more commonplace, and apps from big companies such as Adobe and Autodesk have become increasingly more sophisticated. This has meant the iPad has become much more than a gimmick for artists; it's fast becoming a viable creative tool - you can even use it to control your PC or Mac - bringing it one step closer to becoming an affordable alternative to a high-end graphics tablets. So whether you want to draw, paint or simply just doodle away, we can help you create your own masterpiece with our comprehensive guide to getting more creative with your iPad and iPhone - and we'll even show you what can be done with them once you've finished with our handy guide to sharing your images to the web or back to your PC or Mac. Now integrated with Evernote, Penultimate is a brilliant alternative to scribbling your ideas down on the first piece of paper within arm's reach. Designed to replicate the experience of jotting down notes in a traditional notebook, it has a variety of pen and ink styles as well as a great selection of textured paper backgrounds, from plain to ruled to graph paper, for your every need. You can also import custom backgrounds and can save collections of notes in stylish notebook-style folders that are also searchable. Once your note is finished, you can seamlessly integrate it with Evernote to share your notes between friends and colleagues. If Penultimate and Noteshelf are a bit limited for you, then Adobe Ideas will take things to the next level. Featuring a selection of slick drawing tools that will be familiar to seasoned Adobe users - including a bezier path tool - you can create incredibly advanced sketches in Ideas, which you can then export to Adobe's Creative Cloud and share with the world, or just work on them on your Mac or PC. At £6.99, it's not cheap and it doesn't offer some of the variety of tools that other cheaper apps offer, but it has that Adobe slickness to more than make up for its price tag. While offering the same textured notebook look and feel as Penultimate, Noteshelf lets you take things further with a nice selection of extra features. For example, it has a wider variety of templates (including the option to purchase even more), notes can be arranged on an iBooks-style shelf, where you can add passwords to them for added security, and you can also import photos from your Photos app and add text using iOS fonts, as well as your own hand-writing. Happily, Noteshelf includes support for the new generation of pressure-sensitive styluses, such as the PogoConnect and Jot Touch, which means your notes can be even more dynamic. Sketchbook Pro has a reputation on the Mac and PC as being one of the most advanced drawing apps available, and the iPad version is no different, with a vast selection of familiar drawing tools and features. There are pens, pencils, airbrushes and ink splats, all with a huge variety of presets to apply to your brushes, making it easy to create amazing artwork. With so many tools on offer, the interface can fill up your screen and look fussy, but you can't beat its level of sophistication. SketchBook Ink replicates the subtle variations of pen and ink drawing using a dynamic brush rendering system that means even fully zoomed-in brush strokes don't get pixellated. As a result, you can work in supreme close-up to get brilliantly detailed results, and it also has an infinite canvas, which means you can export images up to 4096×3072px. With pages that actually turn, this is the closest thing to having a sketchbook on your iPad Mixing the best of a sketching app with some cool social media and sharing functions, Paper is like having a virtual sketchbook on your iPad - it even looks like one thanks to its great 3D interface. With a neat selection of brilliant pen-, pencil- and brush-based drawing tools (available as additional In-App Purchases), you won't feel at all restricted. With its simple, artist-friendly interface and rich brush engine, Procreate really is the Leonardo da Vinci of digital painting packages. You can use the wide variety of brushes available, from pen and ink to wet and dry paintbrushes, and you can even edit the multitude of presets to create your own custom brushes that can then be saved and categorised for future use. This makes it easy to flip from one style of painting to another without having to remember the exact settings you chose last time. In addition, with support for pressure-sensitive styluses and Retina-quality HD canvases, Procreate is easily one of the most versatile painting apps available for the iPad. No self-respecting digital artist working on the iPad should be without this essential app. The beautifully rendered brush icons, the corner-positioned colour selector… ArtRage feels more like using an artist's palette for painting than an iPad app - especially when you import a source file and pin it to your canvas for reference. Although it's not as complex as some of its rivals, this isn't a bad thing because what it does, it does excellently. This makes it one of the most usable and instantly accessible painting apps around, and a real delight for anyone who wants to just open up an app and get painting quickly. 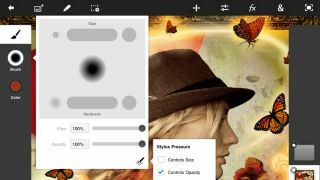 This might just be the closest thing you'll get right now to a desktop painting app such as Corel Painter on the iPad; Art Studio has the most comprehensive collection of options available within its desktop-style menus. With features such as Image Adjustments (such as Curves, Levels and Artistic Filters), and a wide and generous variety of brush options, it's more like Photoshop than Photoshop Touch. You can even import TrueType fonts across from your Mac or PC and use them to create images with non-iOS fonts. By faithfully replicating the desktop user experience, it does lack some of the intuitive usability that Procreate and ArtRage offer. Nonetheless, when you break it down, you simply can't beat Art Studio for it's impressive range of features. Only your imagination will hold you back! Hit the next page for our pick of the best vector drawing, image manipulation and kids' art apps.